Sprucing up for Spring at Stars . 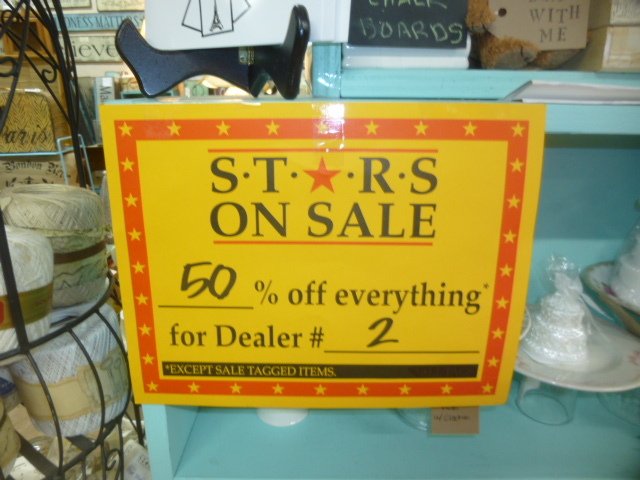 . . AND a Big sale! 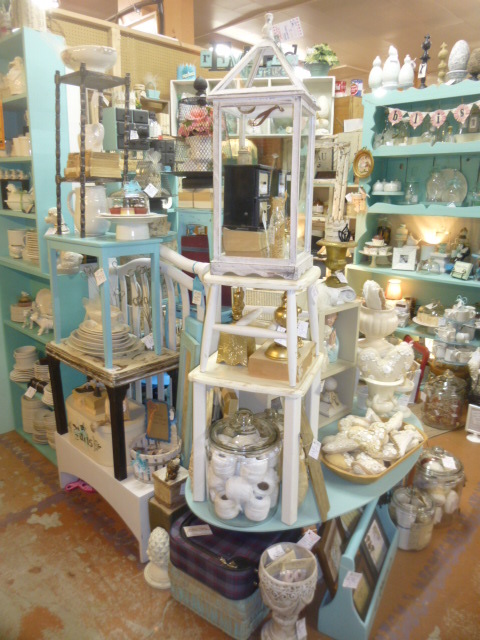 Out with the red and pink and hearts in my booth at Stars, and time to spruce the space up for Spring! 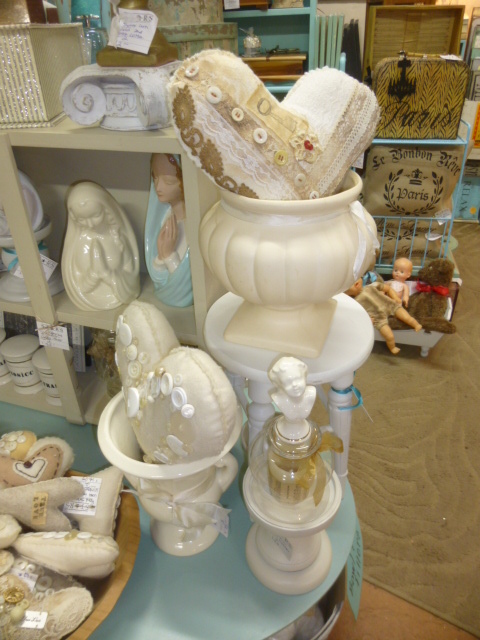 Front focal point display with whites, creams and metallics. Just working with what I have on hand in my booth for now BECAUSE I really need ROOM for lots of new stuff! 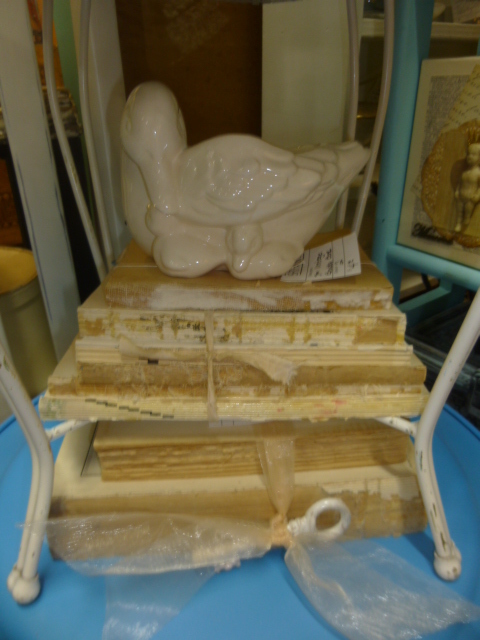 In the meantime, I’ll continue to ‘mix things up’ and style new vignettes to inspire you for Spring decorating, using what I have on hand. 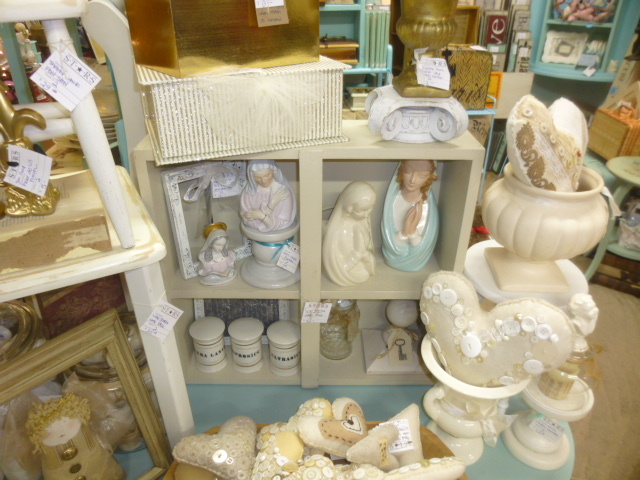 Vintage Madonna statues and vases, pedestals and urns. 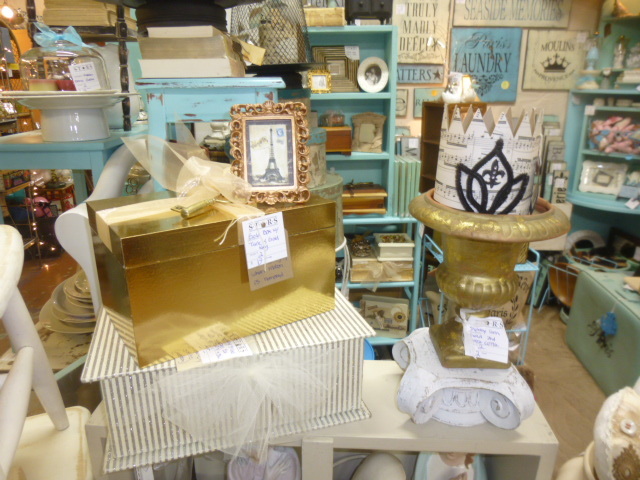 Adding a few more metallic items with those silver and gold boxes. 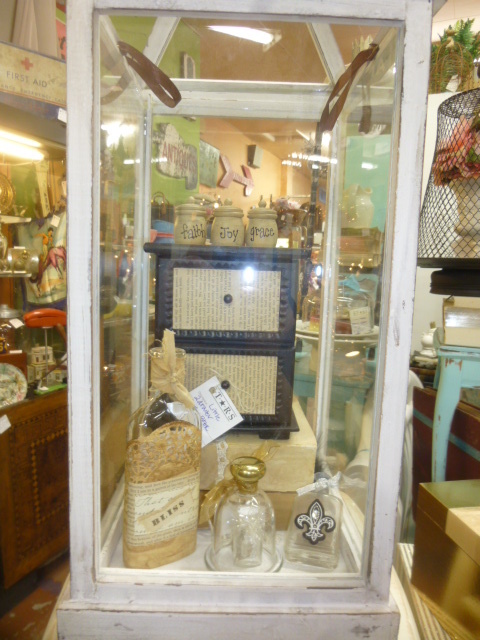 This is actually the BACK side of the front display. 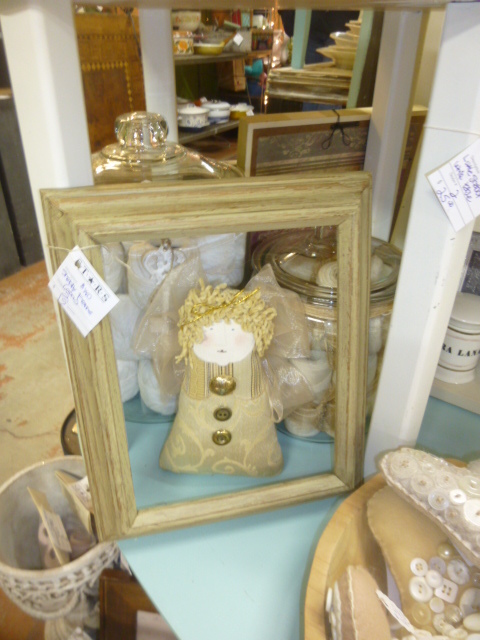 But it SHOWS as you round the corner, so I may as well ‘market the space’! I always really enjoy going with the lighter colors for Spring. 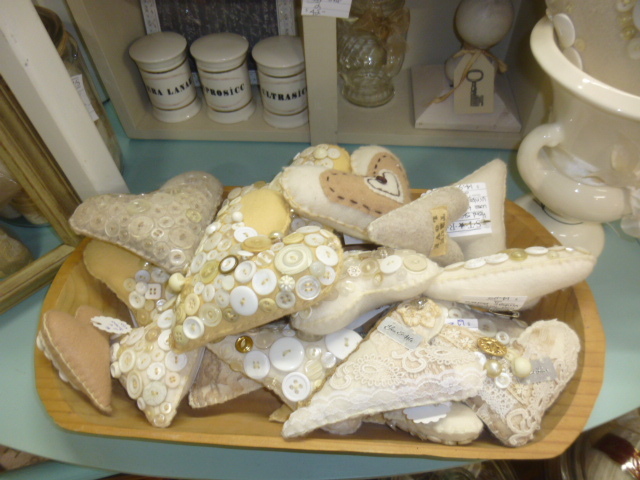 Vintage inspired felt hearts with lace and buttons. 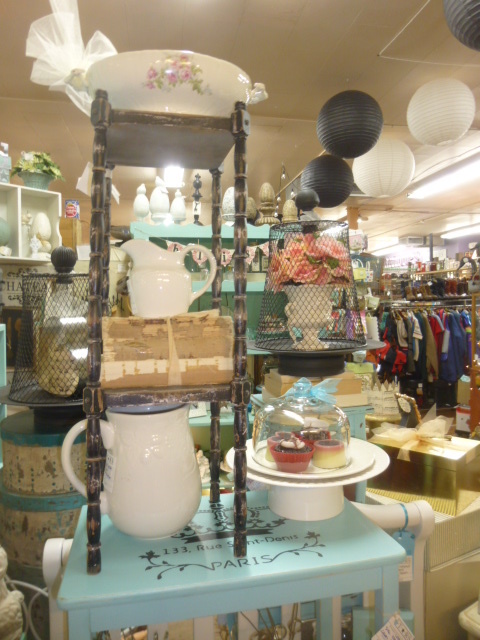 Will be building on the Paris themed items when I bring in new product. 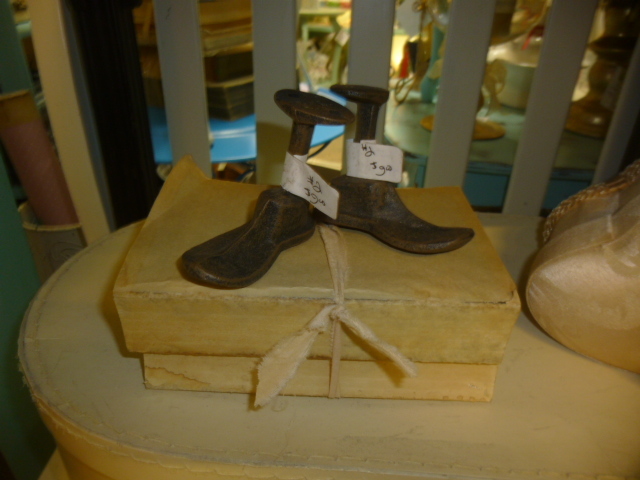 Not many of these reproduction shoe form wall hooks left. 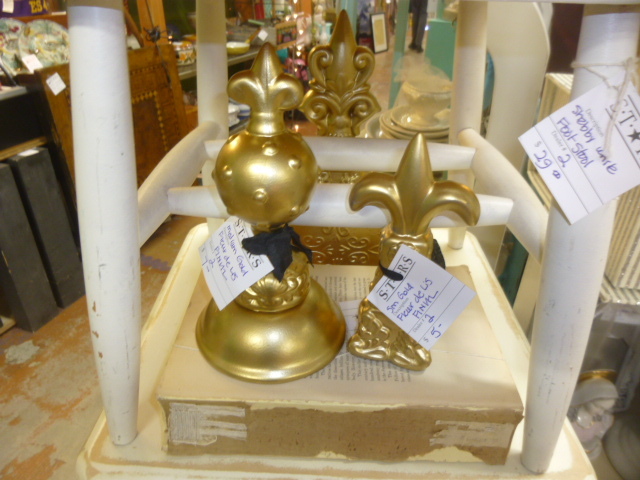 Normally $9.00. They’ll go fast at half price! 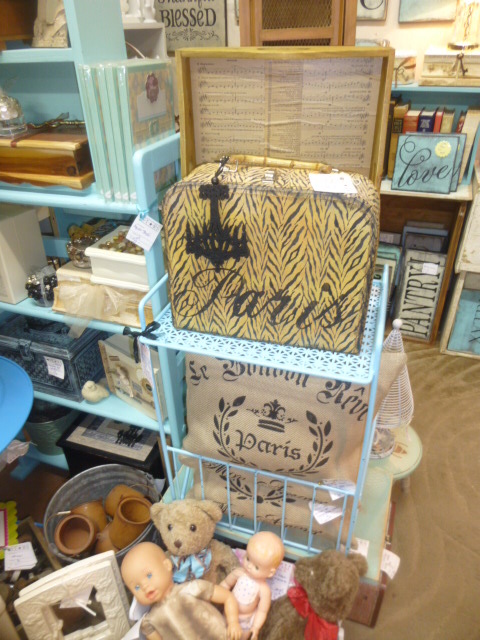 Small Paris carrying case and burlap pillows. 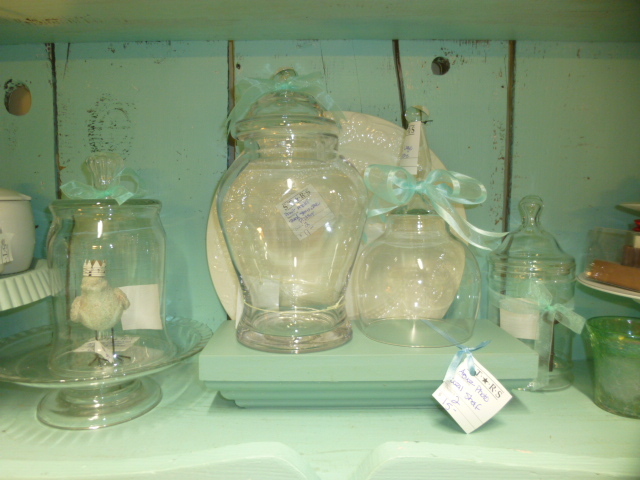 Glass apothecary jars and cloches. 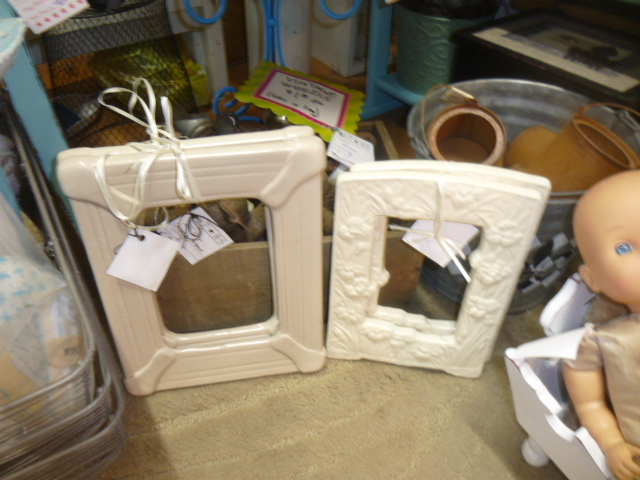 Vintage ceramic frames; one an art deco style and the others a floral motif, are perfect for hanging ‘blank’ where you just need a ‘little something’. 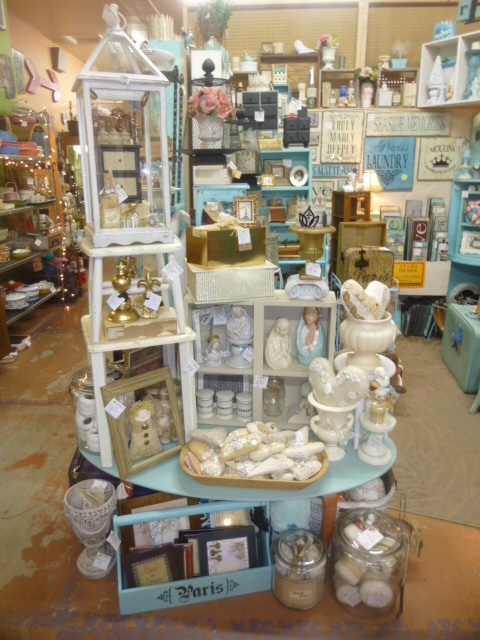 A new display in the giant white lantern. 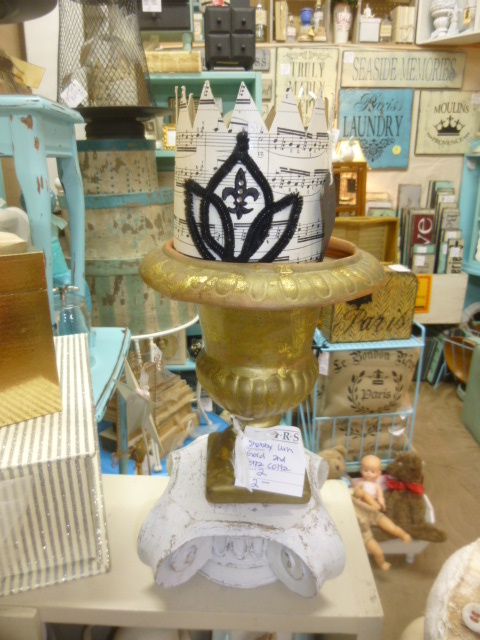 An urn works perfectly as a paper crown stand! 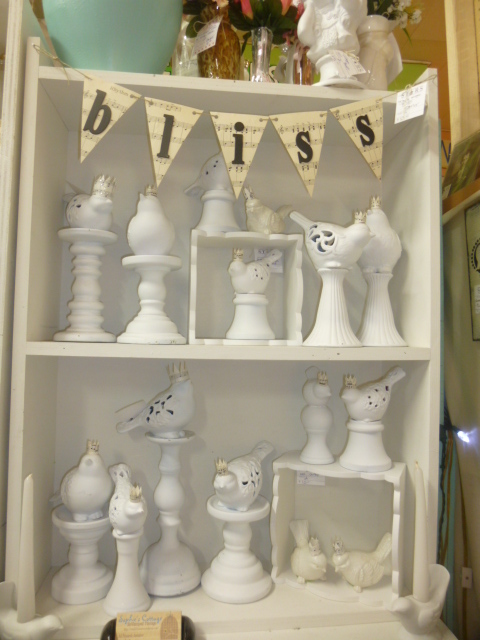 Lots of birds on pedestals and with crowns, of course! 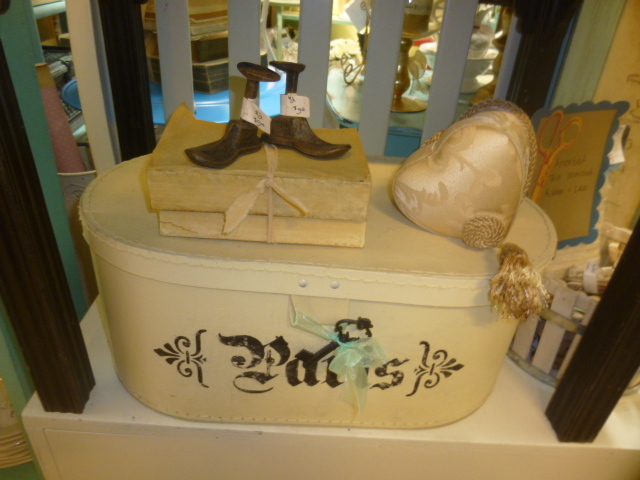 Lots of the vintage grubby book bundles still available. 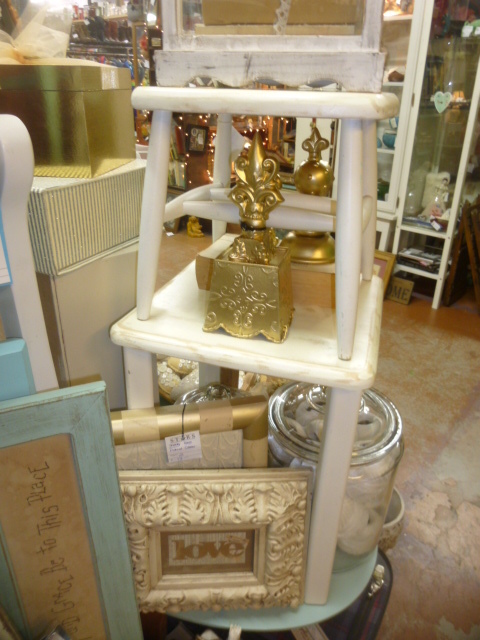 Fabulous shabby black plant stand! 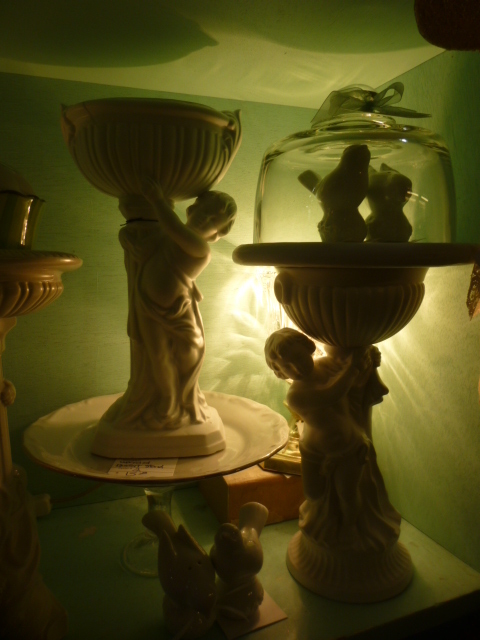 Vintage cherub urns look pretty in this back-lit photo! 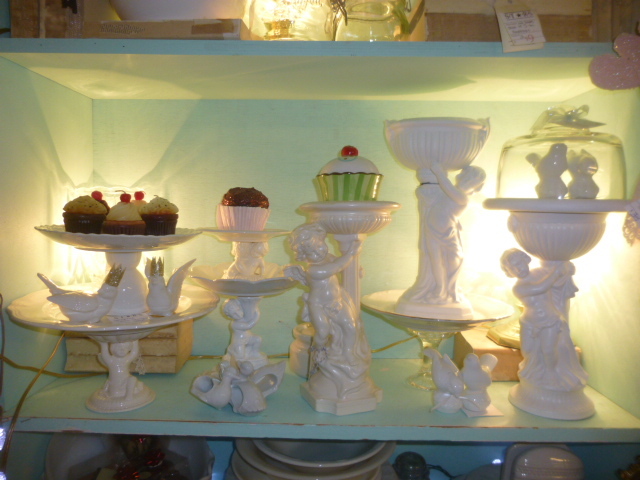 Some have plates added to turn them into dessert stands. 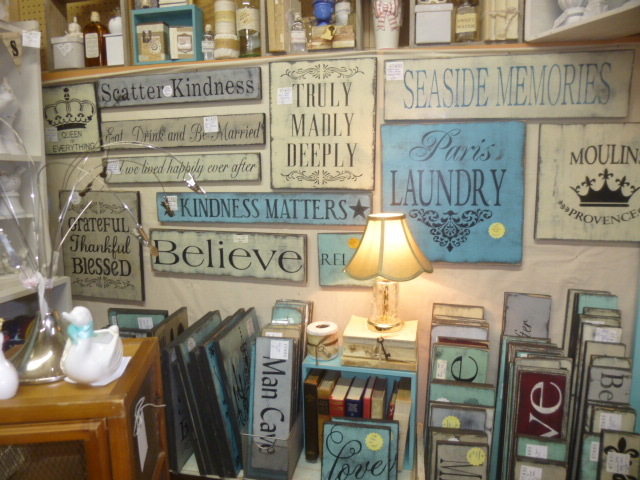 Lots of signs available, as always! 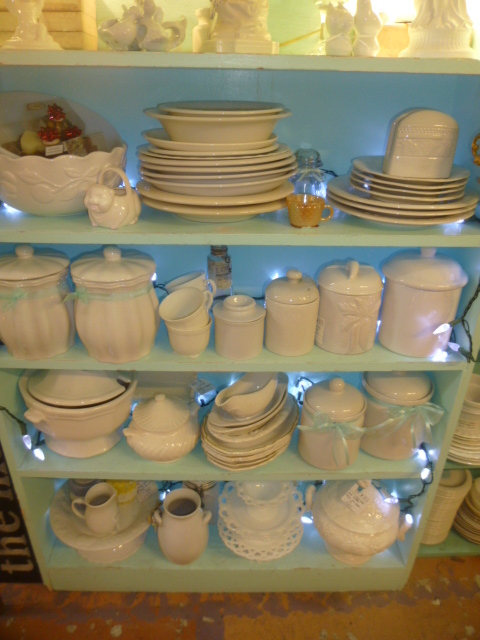 Had your eye on some new white Ironstone pieces?? NOW is the time to grab them! I’ll keep this sale going until enough stuff has sold down for a MAJOR re-do of my booth.